I'm back! After quite a long time away from being able to post anything, I'm back and better than ever! We're still not sure what is wrong with our phone jacks, but I now have a fast internet connection instead of dial-up!!! The good news for you--more pictures (b/c it won't take me 1/2 hour to load each one)!! The good news for me--I don't have to read whole book while I wait for my internet to change pages! Thanks Dad for all of your help getting us straightened out--by the way, I want that recipe for your pumpkin cheese cake dessert...SO yummy! Have a lovely evening--I know I will--I am smiling from ear to ear! P.S. And b/c I can't leave you hanging with no pictures (since I just bragged all about being able to upload more) here are a couple I took LAST WEEK! Can you believe it??? 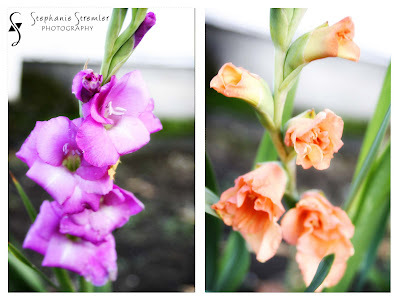 Glads in October...who would have thought. 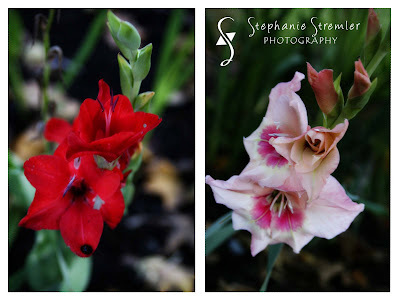 Though they look lovely with my mums and pumpkins, I hope next year they bloom on time with the rest of my glads!